The nation missed an important opportunity at Raglan. If cats have been removed from the Raglan community then, had we the time beforehand to prepare, we could have tested whether cats were a beneficial urban predator, as claimed here and here. 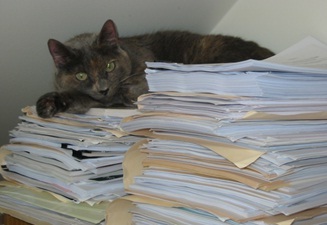 Cats on evidence. Evidence on cats… and their relationship with other wildlife in our neighbourhoods. We could have measured the movements and survival of other native and exotic wildlife, like birds, reptiles, and rodents, in the area before and after cats were removed–called our scientific treatment site. Importantly, we would also have compared the changes, if any, with a similar community where cats have not been removed–called our scientific control site. Unfortunately, the scientific study has not been done or the measurements made. Nevertheless, this has not stopped some from using the Raglan experience as if it were evidence for cats as a beneficial urban predator. Forgive me for disagreeing. Last time I looked ecology was a science. We need better evidence–scientific evidence. Current information that is paraded as evidence, like the Raglan experience and Dr. Flux’s cat, is inadequate for deciding government policy or wildlife management, although it is being used as if it is reliable information. In the absence of a scientific comparison of wildlife before and after cat removal and comparison with a control site, it is premature to conclude that the removal of cats has been detrimental to native wildlife in the Raglan area. The role of cats as predators, good or bad for native wildlife, is context dependent and we do not know what those contexts are or how commonly they occur. 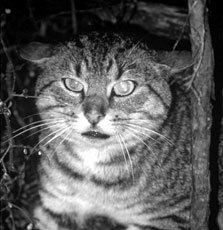 The killing of native wildlife that rats do is a reason for killing rats, not keeping cats (photo source: www.doc.govt.nz). It is certain that cats will not be beneficial at all times and in all places because what cats kill, native or exotic, is context-dependent. It depends on the characteristics of the cats, and the cats’ owners, the relative availability of exotic and native prey… and much more besides. Thus, we should not assume that cats are always and everywhere good. Unfortunately, until the ecological science is done–because it has not yet been done–we do not know under what circumstances cats are beneficial and how common those circumstances are. The benefit of having cats is unlikely to be as great as the benefit of removing all exotic predators of native wildlife–cats and rats. Thus, the presence of rats killing wildlife is not a reason for having cats, it is a reason for killing rats! We would not need cats to kill rats if we got on top of the rat problem in New Zealand’s towns and cities. Would the loss of cats in Raglan, assuming the reports are accurate, have been a problem if the community had themselves also been controlling rats? To improve the evidence, and address the uncertainties that surround the idea of cats as beneficial urban predators, we need a community, like that in Raglan, to take part in an experiment, like the one I have outlined above or here and here. They would keep their cats indoors for a year and we would compare the changes in wildlife abundance and movements in their neighbourhoods with those of another community where cats are free to roam. Until such time as the evidence is improved in this way, we need to implement measures which control ALL exotic predators of our native wildlife, at the same time. Doing the experiment is simple, and it doesn’t require the death of a single cat. Select a statistically representative area or areas, close to urban centers, and create three types of enclosures; one with a completely (introduced) predator proof barrier around it, one with a large predator (cats, dogs, foxes, ferrets, possums and pigs) proof barrier, and with no barrier as a control. Survey the area for native wildlife over 5-10 years, and you should have some meaningful results to base claims upon. Personally I think the results would be interesting for settling debates, but little else. To preserve native wildlife you are going to need large areas with good exclusionary fencing and sufficient pest management, the idea being that any exotic animal that predates native wildlife in those areas is a pest in those areas. Politecol is the blog of Dr Wayne Linklater who is interested in wildlife biology and ecology and human interaction with wildlife.